A journalist shoots video behind barriers blocking the road leading to Saudi Arabia's consulate in Istanbul, Turkey, Oct. 19, 2018. Saudi journalist Jamal Khashoggi entered the consulate on Oct. 2, 2018, and has not been seen since. Saudi Arabia says preliminary results from its investigation into the disappearance of Saudi journalist Jamal Khashoggi shows he died in the Saudi consulate in Istanbul after a fight with people he met there, state media reported. A statement from the Saudi public prosecutor carried Saturday by Saudi state TV said 18 Saudi nationals have been arrested so far in connection with Khashoggi’s death and said royal court adviser Saud al-Qahtani and deputy intelligence chief Ahmed Assiri have been fired from their positions. The prosecutor said the investigation into Khashoggi’s death is still underway. The state-run news agency also said King Salman has also ordered the formation of a ministerial committee headed by the crown prince to restructure the kingdom’s intelligence services. Saturday’s comments are the first admission by the Saudi government that Khashoggi died. Turkish officials had said they believed he was killed in the Saudi consulate in Istanbul after he entered the building Oct. 2 to retrieve paperwork for his upcoming wedding. Saudi Arabia had previously denied the allegations and said Khashoggi had left the building shortly after. He said that he wants to talk to the Saudi crown prince before the next steps are taken. Before the Saudi announcement, President Trump told reporters Friday he might consider sanctions against Saudi Arabia over the disappearance of Khashoggi. Earlier Friday, Turkish police said they questioned employees of the Saudi consulate in their ongoing investigation into Khashoggi’s disappearance. More than a dozen Turkish employees of the Saudi consulate were interviewed, including the consul general’s driver, technicians, accountants and telephone operators, Turkey’s state-run Anadolu Agency said. U.S Secretary of State Mike Pompeo discussed Khashoggi’s disappearance during an interview Friday with VOA contributor Greta Van Susteren. An aerial view of the Belgrad Forest on the outskirts of Istanbul, Oct. 19, 2018. The forest is being searched for possible remains of missing Saudi journalist Jamal Khashoggi. A man enters Saudi Arabia's consulate in Istanbul, Oct. 19, 2018. 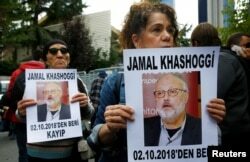 Investigators are looking into the possibility that the remains of missing Saudi journalist Jamal Khashoggi may have been taken to a forest on the outskirts of Istanbul or another nearby city. Turkish authorities also denied Friday they have shared with U.S. officials an audio recording of the torture and killing of Khashoggi. 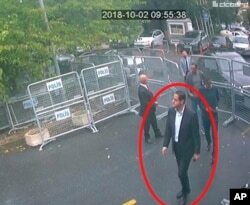 In a frame from surveillance camera footage taken Oct. 2, 2018, and published Oct. 18, 2018, by Turkish newspaper Sabah, a man identified by Turkish officials as Maher Abdulaziz Mutreb, walks toward the Saudi consulate in Istanbul before journalist Jamal Khashoggi disappeared. Late Friday, some U.S. lawmakers weighed in on the Saudi announcement about Khashoggi’s fate. Bob Menendez, the ranking Democrat on the Senate Foreign Relations Committee, said the U.S. should pursue sanctions against those Saudis involved in the journalist’s death under the Sergei Magnitsky, which is named after the anti-corruption Russian accountant who died in police custody.